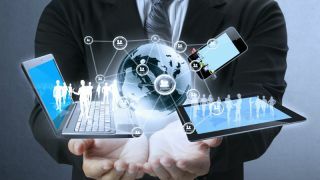 The switch from analogue to digital blurred the lines as organisations, to stay relevant, started to deliver technology products and internally deploy technology solutions. “Digital Transformation is eating the world”. How will your company survive without facing the reality that your company is a tech company, no matter what product or service you offer? A technology company, tech for short is, per definition, a type of business entity that focuses primarily on the development and manufacturing of technology. When we think about tech companies, Microsoft, Apple and Google often come to mind. But in our digitalised world, almost every company is a tech company. Trendy buzzwords like “Internet of Things,” “Big Data” and “Digital Transformation” are examples that the digital world is touching every aspect of our lives – and is simultaneously driving the current and future direction of markets and business. For example, most individuals are unaware what a microprocessor does, yet it is so universal that Intel runs B2C promotional commercials. Before digitalisation, there was a clear demarcation between tech companies and non-tech companies. The switch from analogue to digital blurred the lines as organisations, to stay relevant, started to deliver technology products and internally deploy technology solutions. Today even the smallest shop, freelancer and even a sheep herder can, to some degree, enhance their products via technology. This is certainly true for midcaps and enterprise companies no matter what their product offering or specialty is. Successful organisations are investing in IT solutions that help transform the way they do business so that they may bring value to their customers and stakeholders. The new logistical parameters for technology-based products include the secure and timely delivery of that product or software, to customers and partners. This evolving business pattern demands addressing issues arising from a robust software delivery logistical supply chain. Automotive/Logistics industries – the new tech companies? Nothing exposes the realities of marketplace digitalisation, as does the automotive industry. Hard to believe in less than 20 years the auto industry moved from producing products that were welded together and relied on discreet switches and wires to a mobile digital platform engineered with everything from GPS, multiple CPUs, data bus and are self-driving. Keeping these rolling technology marvels up to date requires not only periodic replacement of tires and brakes but also a serious attention to installing the latest software patches and firmware updates from the manufacture and its partners. Next, consider the evolution of logistics companies, which now handle package pick-up from anywhere in the world, and in real-time track deliveries worldwide. The sophisticated expertise and infrastructure for these companies to stay competitive is undeniably astounding and leads us to classify them as technology-driven businesses. Market pressures demand value- based differentiation, which is efficiently delivered via technology. Customer-focused software enabled technology solutions are that differentiation. Connecting the consumer with the retailer who connects to the logistics company, who connects with the shipper, who connects with the consumer, who connects with the shipper, requires no mistakes and demands all software is up-to-date. How that software is delivered is a critical ingredient to continued customer acquisition and satisfaction. What is truly interesting is how two parallel supply chains support each other leading to multi-party success. As consumers, we are accustomed to updating operating systems, productivity suites and apps on our computers and mobile devices. These updates are so common, that we barely notice the massive technology infrastructure in place to deliver this seamless experience. We just press “update” and trust the rest will just happen. Apple, Google and Microsoft have built massive proprietary delivery environments to service billions of consumers. At their scale, these proprietary in-house created technologies make economic sense. However, for B2B enterprise software delivery, developing, deploying and maintaining delivery engines is not cost effective and could even be a sore spot with customers. Enterprise software developers, who migrated from physical media, building their own in-house engineered delivery engines and portals, are finding that those efforts are crumbling under the lack of scalability of those platforms. Back in the day, there was no scalable SaaS-based delivery technology, so every component was built from scratch or consumed off the shelf. These issues are compounded when product-based companies find themselves under pressure to develop a software logistics strategy, which might not exist in any form or is being serviced with ad-hoc methods. Typically, these companies neither have the level of experience delivering software nor the technology. As a result, these companies often use what is available at hand like email, FTP and free sharing tools. Tracking and scalability are impossible and the ultimate casualty will be loss in productivity and sales. Couple that with the risk of losing valuable intellectual property and exposing data to external threats and you have a recipe for calamity. Enterprise software delivery solutions help product-based businesses focus on what they do best and relieve them of the heavy lifting of software delivery logistics. Throughout the technology world, management of software entitlement and licensing via spreadsheets and outdated proprietary databases is pervasive. The decoupled nature of these approaches results in ineffective tracking, which results in delivery ambiguity and compliance liabilities. For public companies to be fully compliant with FASB 97-2.18, they are required to have an electronic delivery technology that guarantees the very last bit was downloaded, must integrate with their CRM and is ready for audits via tracking data. Missed SLAs and compliance issues coupled with restating financials is embarrassing, expensive and can destroy a customer’s trust. Electronic Software Delivery solutions protect digital products from non-revenue usage by allowing exclusive access to software to those who are entitled. Oftentimes, support patches are not well tracked and customer profiles are not up-to-date, allowing those out of support to obtain patches and the latest builds that they have not paid for. Another aspect to consider is support desk. What happens when support desk personnel who are engaging with key customers don’t have easy access to data of what the customer is entitled to or even has downloaded? Customer satisfaction (C-Sat) goes down, and eventually affects the bottom line. Technology businesses of all vertical markets and sizes encounter issues managing the delivery of software products and support. Sinking customer satisfaction scores, compliance errors, missed revenue and SLAs are symptoms that can be overcome with the right ESD solution. To take control of software delivery, an organisation needs to be equipped with tools that secure valuable intellectual property, streamline productivity while enabling visibility into the logistics of software distribution. These businesses need ESD.